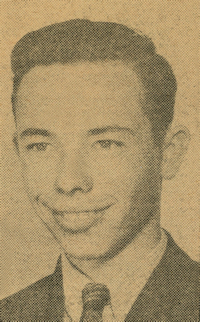 Obituary – Maine, Ernest Leonard « Perry High School Alumni Association, Inc.
﻿- 18-year-old son of Mr. and Mrs. M. Maine. He was born May 25, 1922, in Perry. He has attended the Lutheran school and the Perry schools and is a member of the Lutheran church and the Walther League. Hobbies are photography and radio. Ernest plans to attend an aviation trade school. Ernest Leonard Maine, 94, of Perry passed from this life on June 3, 2016. Services have been entrusted to the care of Palmer Marler Funeral Home and a service celebrating his life will be held at 10am on Tuesday, June 7, 2016 at Christ Lutheran Church in Perry, OK. Public visitation will be held on Monday, June 6 from 9am-8pm at the funeral home. Ernest Leonard Maine was born on May 5, 1922 in Perry, OK. He grew up and attended schools in Perry, graduating from Perry High School. In 1942 he joined the US Army where he served as an airplane armorer. While stationed in Arizona, Ernie and several other soldiers were invited to Sunday dinner by kind local family. It was at this dinner that he met the love of his life and his bride of over 70 years, Bessie Manning. Ernie and Bessie decided to relocate to Florida. On their way from Arizona to Florida they dropped by Ernie’s former hometown of Perry so that Bessie could meet other members of the Maine family. The visit went very well and 7 decades and 3 children later, they still call Perry home. Ernie went to work as the “pressman” at Eby’s Cleaners where he worked until accepting a job at Charles Machine Works in the late 1960’s. He retired from CMW in 1989 after nearly 20 years of service. This retirement was short lived, as he soon after accepted an opportunity to become the maintenance man for Christ Lutheran Church and Christ Lutheran School, a job he absolutely loved. He was a dedicated and meticulous servant who put everything he had into everything he did. During his 25 years at CLC, it wasn’t uncommon to find Ernie in the basement bailing water at 2am or on his knees in the flowerbed pulling weeds in the July heat. Ernie never complained because he was doing what he loved. He made many wonderful friends at Christ Lutheran Church and it was a difficult day when heath issues forced his “early retirement” at age 93. He was a hard working man with boundless energy and his friendly demeanor and ornery personality made him easy to love. When Ernie was not working, he could be found wood working and mowing. Those who knew him best knew that the two most important things in his life were his faith and his family. 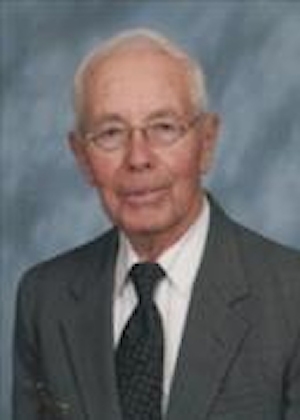 The Maine family was long time members of Christ Lutheran where Ernie served as an elder, Sunday school superintendent, treasurer, and a trustee. Family was always a priority and Ernie worked hard to provide for them. He served as a Boy Scout Leader for many years and always enjoyed getting to take his family camping. Ernie Maine had a smile that could light up even the darkest of days and that smile was never more evident than when he was spending time with his grandchildren and great grandchildren. He made many great friends and memories during his 94 yrs of life and he will be missed by all who knew and loved him. Ernie was preceded in death by his parents. He is survived by his wife Bessie Maine. Three children: Dennis Maine and wife Gloria of Perry, Diana Hamburg and husband Daniel of Perry, and Janelle Keith and husband Terry of Perry. Eight Grandchildren: Stephanie Rames and husband Steve, Desi Stoops and wife Georgie, Darren Maine and wife Monica, Randall Stoops and wife Casey, Derek Hamburg and wife Alyssa, Dustin Hamburg and wife Mary, Lindsay Bernhardt and husband Billy, and Shayne Keith. He is also survived by 13 great grandchildren and a sister Virginia Eggers of Morrison, OK.